Even though this summer was crazy busy for me; being a new mom, 7- hour trips to the cottage and visiting friends & family, it was important for me to keep up with my passion for nutrition and healthy living. Here is a list of healthy tips, ingredients, tools & recipes that I was lovin’ this summer! An orange spice common in Indian cuisine; turmeric root is amazing for preventing inflammation. Why is inflammation so bad? It wreaks havoc on your immune & digestive systems, can cause belly fat & insulin resistance, and can interfere with your weight loss efforts (1). 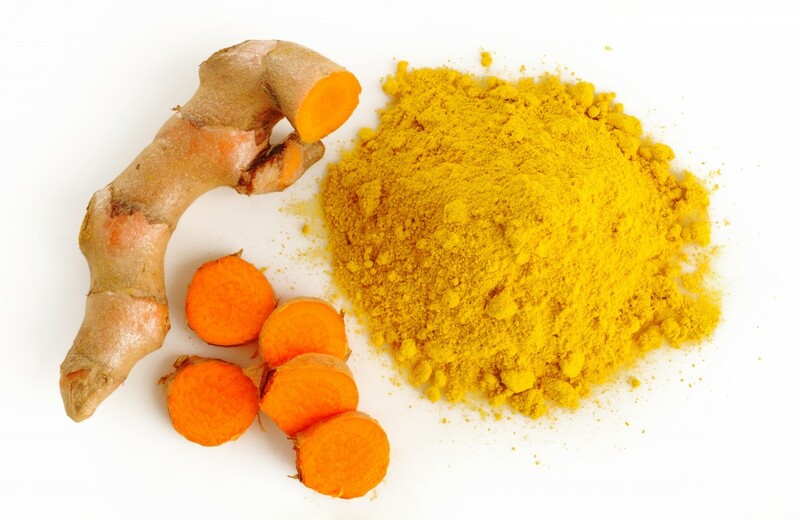 One thing you can do to prevent inflammation is incorporate turmeric in your daily diet. I started putting 1 tsp. of turmeric in my morning smoothie, but you can also add it to soups, salad dressings, stir-fries and spice rubs for poultry & fish. Your entire body runs more smoothly when you eat anti-inflammatory foods! This little tool is an amazing way to include more veggies in your daily diet, and cut out the cals from regular pasta noodles. Pop a zucchini in the top, twist, and voila – zucchini noodles! 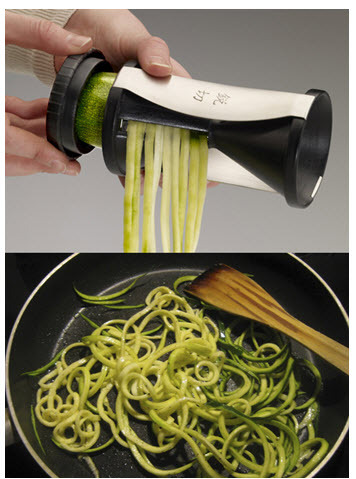 Zucchini has a neutral taste so the noodles take on the flavor of whatever dressing or sauce that you add to the dish. I personally like them with Thai flavors, but you can also add pesto or tomato sauce for a spin on your fave Italian pasta! They are low in cals, and high in vitamins & minerals. Available at Bed, Bath & Beyond. I didn’t know busy until I had a baby. Sometimes it’s difficult to find a few minutes to brush my teeth let alone make a salad! 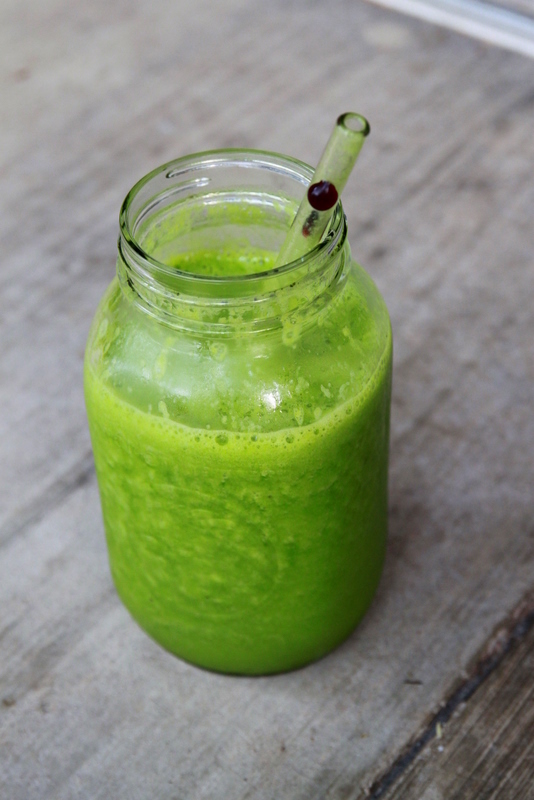 To ensure I get my quota of greens for the day, I add them to my morning smoothie. I put all the other ingredients in the blender first (banana, seeds, oils, berries), and than fill my blender to the top with organic baby spinach, swiss chard or kale. You can’t even taste them, and you can feel good knowing that you’ve had a full salad before noon! 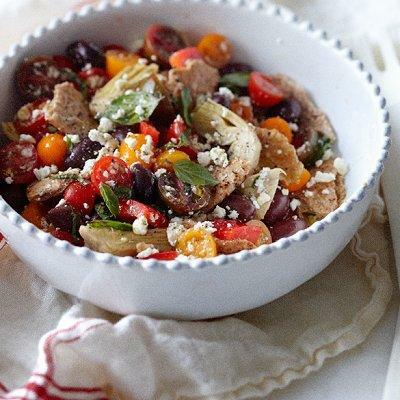 This recipe from Chatelaine has been a favorite in our family for years because unlike other salads; it eats like a meal. It’s loaded with fresh raw vegetables, healthy fats and protein – the perfect healthy lunch for sunny days by the pool or at the cottage. There are a lot of ingredients, but it’s perfect for entertaining because you can prep it all ahead of time. Fish is something we should be incorporating into our diet at least once per week, but it can be difficult to make fish taste really good. 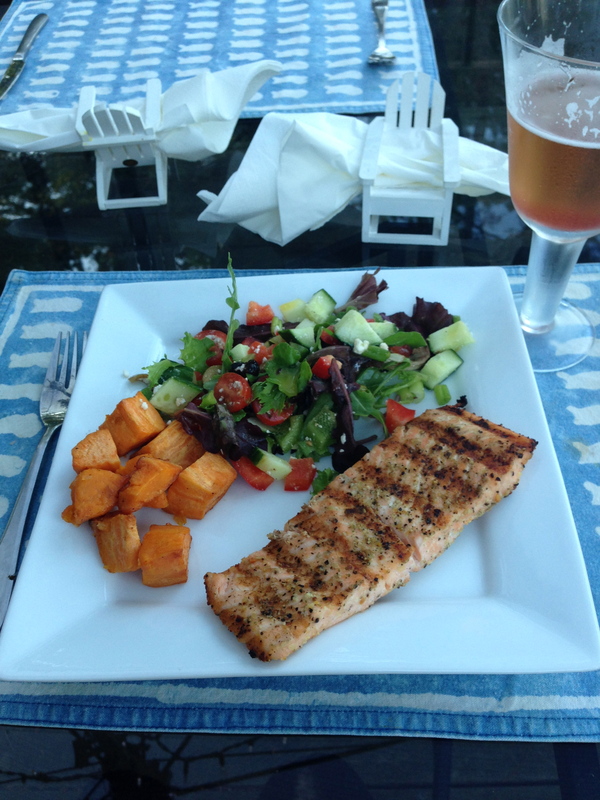 This summer we decided to start BBQ’ing our fish instead of pan-frying or baking it, and the results were amazing. I actually look forward to having fish for dinner every week! Just brush the fish (salmon, cod, trout, pickerel – whatever you like) with some avocado oil, and season with salt, pepper and Mrs. Dash. Cook on the BBQ for about 8-10 minutes depending on the thickness of the fish. Exfoliating your face daily not only provides you with a deep clean, but it promotes younger-looking skin, improves the skin’s texture and reduces pore size. 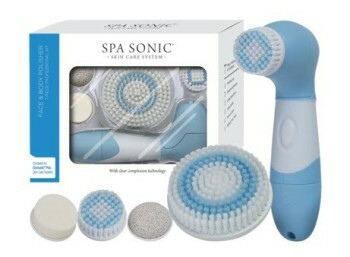 I recently bought the Spa Sonic Skin Care System at Winners ($40) and I love it. Not only does it make my skin feel great, but it’s a healthy alternative to using facial scrubs that are full of harmful chemicals. Welcome! I’m Lauren Follett. A couple years ago, while working in the corporate world of downtown Toronto, I decided to pursue my passion for healthy living and enrolled in the Distance Education program with The Canadian School of Natural Nutrition. I studied on my lunch breaks, after work, on the weekends, and while travelling through South America. The world of health & nutrition can be confusing. There are a lot of mixed messages out there when it comes to health: low fat, low calories, sugar-free, low-carb, gluten-free…leaving you confused, frustrated, and wondering where to start. That’s where I come in. As a Registered Nutritionist, my goal is to help you accomplish your health & wellness goals. I don’t believe in diets or quick fixes. I believe in living a healthy lifestyle, which requires you to get educated, and learn how to make healthy choices. I’m dedicated to working closely with my clients to teach & motivate them to make healthy choices, discuss healthy living strategies and create customized nutrition programs that fit with their life. Celebrate National Soup Month with my Coconut Curry Pumpkin Soup! © 2019 Lauren Follett Registered Nutritionist. All Rights Reserved.